In an article in Military Cyber Affairs, researchers claim to have uncovered evidence that China Telecom has been deliberately using Border Gateway Protocol (BGP) hijacking to selectively divert internet traffic originating in the US and Canada through China. In their article in Military Cyber Affairs, The Journal of the Military Cyber Professionals Association, Dr. Chris Demcheck, Director of the Center of Cyber Conflict Studies at the US Naval War College, and Dr. Yuval Shavitt, Professor of Electrical Engineering at Tel Aviv University, suggest that China has found a way to gather valuable information from US organizations while still technically adhering to the 2015 US-China Cyber Agreement. In the voluntary 2015 US-China Cyber Agreement, China’s President Xi Jinping agreed that Chinese military forces would cease hacking US commercial organizations for financial gain. The route tracing system, based at Tel Aviv University, was built for DIMES, a project to study and map the structure and topology of the internet. Border Gateway Protocol (BGP) is an internet routing protocol that requires using the shortest route to move data traffic between the source and the destination IP addresses. “Forwarding tables,” built by servers hosting BGP, are used to determine the shortest route and the path that packets should travel between the smaller autonomous networks (AS) by passing through internet points-of-presences (PoPs). A ZDnet article explains it simply, “PoPs are data centers that do nothing more than re-route traffic between all the smaller networks that make up the larger internet.” “Traffic travels between these AS networks with the help of the Border Gateway Protocol (BGP),” a protocol created in the early 1980s and lacking in security controls. BGP hijacking occurs when false BGP announcements are made intentionally with malicious intent. BGP hijack attacks are also difficult to detect and protect against because, “it is not a hack of the endpoint but of the critical exchanges carrying information between end points.” Users do not need to click on a bad link, and network administrators cannot see any changes in data transfer patterns. Sensitive and valuable data could rerouted, copied and collected, and forwarded to the correct destination with only a brief delay. China Telecom is a large telecommunications company based in China but with ten Chinese-controlled internet “points of presence” (PoPs) across North America, eight in the US, two in Canada. According to the China Telecom Americas website, their PoPs were first established in the US in 2000. According to Demcheck & Shavitt, in 2010 China Telecom hijacked 15% of the Internet traffic for 18 minutes in what is believed to be both a large-scale experiment and a demonstration of Chinese capabilities in controlling the flows of the internet. October 2016, traffic from several locations in the USA to a large bank headquartered in Milan, Italy was hijacked by China Telecom to China. This article shows that internet communications can be vulnerable in ways that cannot be easily detected and cannot be prevented. The researchers, Demcheck & Shavitt, highlight the possible impact that China’s use of BGP hijacking can have on data confidentiality and availability, but the problem could be much larger than the instance described. Data integrity could also be affected, and China may not the only country attempting to use BGP hijacking to snoop on data sent across the internet. Demcheck & Shavitt discussed how BGP hijacking could cause network traffic to be rerouted so that it could be intercepted, copied, and sent on without either sender or receiver noticing, but they also described one instance of traffic being rerouted and never reaching the intended recipient. Data from US companies or from anyone could conceivably be intercepted, copied, and held so that the recipient never received it, all without the original sender or the intended recipient knowing anything is amiss. 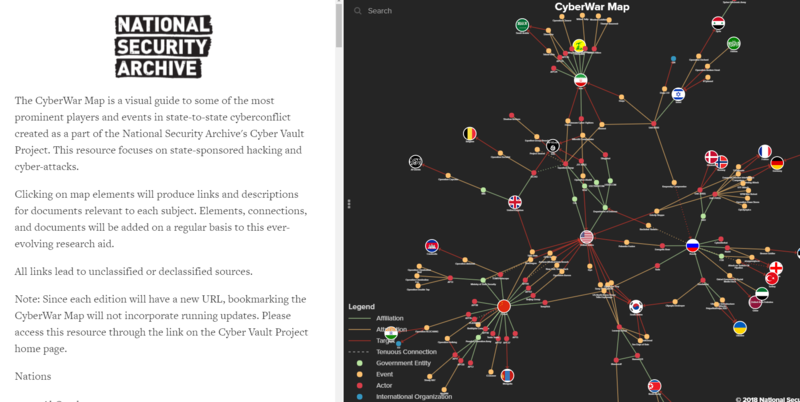 The CyberWar Map is associated with the Cyber Vault Project, an online repository of declassified or unclassified primary-source documents “obtained under the Freedom of Information Act and from other sources” documenting cyber activities of the U.S. and foreign governments. The Cyber Vault Project, funded by The Hewlett Foundation, is part of George Washington University’s National Security Archive. Clicking on a flag, dot, or line causes the side panel to load relevant information including links to related documents. The sidebar default shows a list of links for “Nations” which includes groups that operate beyond a country’s borders, for example, Al Qaeda, and ISIS. The “Focus” option allows users to see only information related to a specific node. 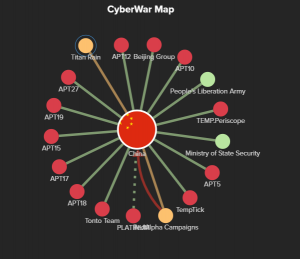 The CyberWar Map is based on a mindmap and is not meant to resemble a geographical map. This abstraction of dots and lines can help users identify surprising connections that might be overlooked when reading an article or consulting a spreadsheet or database. Although the map connects to some declassified US government Cyber Vault documents, the majority of the documents offered for specific cyber events come from news organizations or security researchers. Often there is only a single source listed for a cyber event. 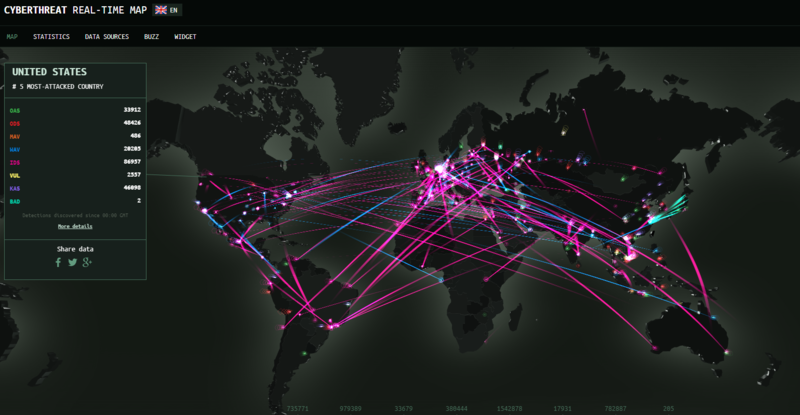 The CyberWar map also deals with more recent cyber events. The earliest event article found was dated 2010. This map also seems to lag slightly behind the documents made available in the Cyber Vault which seems to be extremely timely and current to the day of document release. In July 2018, the VPNFilter malware reportedly tied to a Russian military intelligence agency infected a chlorine station connected to Ukrainian water treatment and sewage plants. This intrusion is the latest in a string of disruptive Russian cyberattacks to target critical infrastructure in the past three years. VPNFilter also made news in the US in May 2018 when 500,000 routers and other devices for small office/home office use were discovered to be infected by the malware. In May 2018, alerts and news releases from US-CERT, the US Department of Justice, and the Federal Bureau of Investigations warned that the VPNFilter malware had infected 500,000 routers and other devices in 54 countries. This means that many of the most popular routers and data storage devices often used in homes or small office settings were vulnerable to infection by malware that allowed for snooping. VPNFilter also had a “kill function” that would render these infected devices inoperable. A kill command sent out to all infected devices could have led to half a million homes or small offices losing internet access or saved files. It is also notable that VPNFilter was so modular and adaptable that malware perhaps originally used to monitor network traffic and steal the website sign in information of home users also had the capability to monitor Modbus packets which are used in industrial settings and not in homes or small offices. A May 2018 blog post by Talos suggested that because of a spike in VPNFilter victims located in Ukraine and code similarities between VPNFilter and the BlackEnergy malware responsible for power outages in Ukraine in 2015, they suspected that devices infected by VPNFilter might be used as a botnet for a future cyberattack against Ukraine. Ukraine and its critical infrastructure has been targeted by cyberattacks in the past. The NotPetya and Bad Rabbit ransomware attacks in June and October of 2017 affected critical infrastructure organizations in energy, communications, transportation, manufacturing, banks, and the Chernobyl radiation monitoring system. The BlackEnergy attack in December 2015 and the CrashOverride/ Industroyer attack December 2016 both targeted the power grid, leading to power outages. Russia is suspected of being the source of the cyberattacks targeting or affecting Ukraine’s critical infrastructure that have occured since the 2014 Russian annexation of Crimea. We have reached a new stage in which nation-state cyber operations no longer only affect powerful, high level targets like government agencies, the military, political leaders, and huge corporations. Nation-state sponsored cyber operations are now affecting the safety of regular people. With VPNFilter, home users and small business owners and the devices in our homes were the target. Critical Infrastructure providers that offer water treatment, electricity, and other critical services to the general public are now targets. In the case of the Aulska Chlorine Station, the goal of this cyber intrusion appears to have been to affect the functioning of the station which would in turn affect the water and sewage treatment facilities across Ukraine. If this attack had not been averted, a cyberattack launched by one country would have, in effect, tampered with the water supply of a neighboring country. As nation-state sponsored cyber activity moves beyond espionage and cyberattacks begin to have physical results that affect human safety, events like the targeting of the Aulska Chlorine Station should rouse governments around the world to come together and decide which types of cyberattacks might be considered an act of war comparable to a physical armed attack that would warrant exercising the rights of self-defense in response (as discussed in the United Nations Charter, Chapter VII, Article 51). For a more in-depth technical discussion, please see the article by our Vulnerabilities Analyst. For more information on how to prevent and mitigate VPNFilter infections, please see the article by our Best Practices Analyst. Schmitt, M. N., & Vihul, L. (2017). Tallinn manual 2.0 on the international law applicable to cyber operations: Prepared by the International Group of Experts at the invitation of the NATO Cooperative Cyber Defence Centre of Excellence. Cambridge: Cambridge University Press. The Shakacon X IT Security Conference was held at the Prince Waikiki on July 11-12, 2018. Blaich and Flossman trace the path of spouseware that is being adapted, sold, and used by nation state actors. Spouseware is surveillance software generally used to spy on a spouse or partner. Legitimate spouseware apps available in the Google Play store share code and C2 infrastructure with surveillance software being used by nation state actors because the same developers work on both. Adapting spouseware to nation state surveillance is easy because both have the same goals and need to have the same capabilities: device info and tracking, call logs, screen capture, audio recording, photo and file stealing. 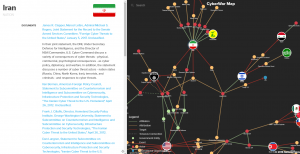 Hirani and Caban provide an overview of Iranian threat actors APT 33, APT 34, APT 35 and others. The explored the targets and TTPs of each group, described similarities and differences between them, and discussed the process that they as researchers used to gather information and study the groups. Crumbach talks the audience through one social engineering operation that occurred while performing a pen test on a bank. Into his story of how a phone conversation led to physical access of a bank vault full of money, he weaves in in tips for social engineering success. Park describes his team’s experiences with tracking Olympic Destroyer and the cyberattack on the Pyeongchang 2018 Winter Olympics. He discusses malware characteristics including the false flag tactics used to make Olympic Destroyer appear to be the work of Bluenoroff, a subgroup of the North Korea affiliated group Lazarus, who was initially suspected as the culprit. 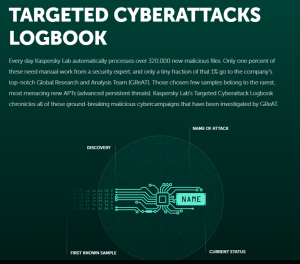 The threat group Kaspersky calls Hades is thought to be responsible. Olympic Destroyer infections did not cease after the 2018 Winter Olympics. They have continued with new targets on financial institutions in Russia and biological and chemical threat prevention laboratories in Europe. 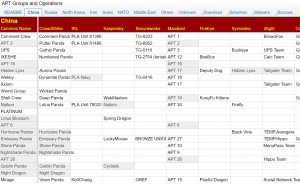 Although Park did not discuss a location or country affiliation for the Hades threat group, Kaspersky Labs’s Securelist APT Trends Report for Q2 2018 notes similarities between Olympic Destroyer activity and the Sofacy Group associated with the Russian military intelligence agency GRU. Keynote: What is the hacker community? Johnny Long, author of Google Hacking for Penetration Testing and twelve other infosec books, talked about how the hacker community came together to support work he has done to further technology education around the world, including: setting up computer learning centers, vocational training, and hackerspaces in Uganda, offline education stations and robotics programs in Kenya, disaster response technology support in Puerto Rico after Hurricane Maria, and creating community security awareness training classes and makerspaces in Louisville and other cities in the US. A Tennessee county elections website was the target of a cyberattack that crashed the site on primary election night while a network intrusion was quietly taking place at the same time. A vote total reporting website in Knox County was targeted by a distributed denial of service (DDoS) attack that brought down the website for an hour after the polls closed during a recent primary election, but this DDoS attack acted as a distraction while a second more sophisticated attack, a network intrusion, occurred simultaneously. Ball say that the intrusion affected a county server that contained only publicly available information. No personal or confidential information was present on the server. “It was not an attempt to actually change any data or put anything onto our servers; it was an attempt to take things off of our servers, to read what was there … they were looking to get things, not give things,” Ball said. The cybersecurity company hired to investigate the attack, Sword & Shield, stated in their report that IP address from 65 countries were involved in the DDoS attack, including a Ukraine IP address that was involved in the server intrusion. In the AP article dated May 12th, a spokesperson for the FBI in Knoxville said that the county had not reached out to the FBI for assistance in the investigation, nearly two weeks after the attack took place. A more recent May 17th Knox News article says that both the FBI and the Department of Homeland Security are now assisting in the investigation. Cyberattacks targeting elections could be used by foreign state actors to disrupt the democratic process and damage public confidence in their results. This event was a small scale cyberattack that did not affect vote tallies and caused no lasting damage, but it is significant because it highlights the important role that local elections officials and local IT workers play in US election security. Smaller county elections are now targets for cyberattacks, and we must be prepared to defend the election process starting at the local level. Local, state, and federal officials and policy makers will have to work closely with IT administrators and workers and the information security community to secure elections. Local and state officials should be aware of the resources and assistance that can be provided by federal organizations. The federal government, federal organizations, and policy-makers can, in turn, provide clear guidance, sufficient funding, and timely, effective assistance to the local officials and IT workers who are also working toward the same goal of securing our US elections. A cyberattack on a US Navy contractor resulted in the theft of sensitive military plans in this latest incident of Chinese industrial espionage targeting military contractors. Government hackers working for China’s Ministry of State Security have stolen 614 gigabytes of “highly sensitive” from a US Navy contractor. The unnamed contractor was employed by the Naval Undersea Warfare Center, an organization that conducts research and development for submarines and underwater weaponry. China’s Ministry of State Security, the perpetrator of the data theft, is described by the Washington Post as “a civilian spy agency responsible for counterintelligence, foreign intelligence and domestic political security“ which includes a foreign hacking department. This incident is the latest in a long string of similar industrial espionage efforts by China to target and collect US intellectual property by technological means or through business partnerships. In the past ten years, China has stolen US military aircraft, ship, and weapons system designs and plans. “This morning at 5:37am we were notified via an alert that an unknown individual… had posted a screen shot from what appeared to be a compromised Alaska Division of Elections reporting system. The Global Cyber Environment section covers significant or large-scale cybersecurity events with global, regional, or local impact that may influence security and business strategies. 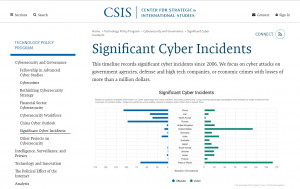 The Global Analyst position delivers weekly executive summaries about current cybersecurity events to inform and strengthen Hawaii’s community. Major data breaches affecting the general public, the US government, or the state of Hawaii. The U.S. Department of Justice’s recent indictment of nine Iranians accused of conducting cyberattacks contained a list of targeted organizations that included the State of Hawaii. This announcement coincided with “unusual activity” noted in dozens of State of Hawaii email accounts. On March 23rd, the U.S. Department of Justice (DOJ) announced indictments charging nine Iranian nationals working for the Mabna Institute with malicious cyber-enabled activity and the theft of intellectual property and academic and proprietary data on the behalf of Iran’s Islamic Revolutionary Guard Corps (IRGC), an intelligence-gathering government entity. The DOJ indictment announcement states that 31 terabytes of documents and data was taken from American and foreign universities, American and foreign companies, and U.S. government agencies in a campaign that spanned from 2013 to December of 2017. The news release lists targets of the Mabna Institute, including the state of Hawaii, the state of Indiana, the U.S. Department of Labor, the Federal Energy Regulatory Commission, and the United Nations. Thousands of professors at hundreds of universities across 21 countries as well as 47 private sector companies were also targeted. A Hawaii News Now article describes a timeline of events, saying the first phishing emails targeting the state of Hawaii arrived on Saturday, March 21 when an employee at the state Department of Agriculture clicked on a malicious link. On Monday, March 23, an employee at the state Department of Human Services also clicked on the link. ETS believes that the two phishing attempts are connected and the emails come from the same source. After the first user clicked on a malicious link, “a warning from the state’s IT office was sent out to workers reminding them not to open links without investigating first,” State CISO Vincent Hoang was quoted as saying. “We can throw a lot of technology at it but at the end of the day, the best defense is relying on our users by educating them.” Hoang described one element of this user education and training when he mentioned conducting “mock cyber attacks sending out fake links to see how many state workers click on them”. Hoang says they have had positive results with these training exercises, but when faced with a genuine phishing email, at least two state of Hawaii employees still clicked on those malicious links. The most vulnerable point in any information security scenario continues to be the human user, and this weakness can only be solved by effective and continual user education that works when tested by real-world situations. Connection to UH Data Breach? Although there has been no mention of the Mabna Institute cyberattacks being connected to the University of Hawaii data breach that took place in September 2017, we know that the systems of hundreds of unnamed universities and the accounts of over 100,000 professors both in the U.S. and abroad were targeted by the Mabna Institute. The date of the UH data breach falls within the active dates of this campaign. The United States Department of Justice, Nine Iranians Charged With Conducting Massive Cyber Theft Campaign on Behalf of the Islamic Revolutionary Guard Corps. 23 March 2018. State of Hawaii, Office of Enterprise Technology Services, Response to the Department of Justice’s Indictment Charging Nine Iranian Nationals Regarding Cyber Intrusion. 23 March 2018. Hawaii News Now, State on high alert after hackers target 2 agencies in ‘phishing’ attack. 27 March 2018.US-CERT, Alert (TA18-086A), Brute Force Attacks Conducted by Cyber Actors. 27 March 2018. UHWO CSCC article, University of Hawaii Data Breach. 26 JAN 2018.